Who said socialisation and dementia don’t mix? Not us and we’re the dementia in Home Care specialists! Fact: No one really lives independently in the community. Socialisation is just that… spending time with others. It is what we all like to do. Unfortunately for some community members with dementia, this is something they crave, yearn and wish for. Sometimes it is seen as a hope, a dream or a desire but without help… it will never be an option. Why don’t those with dementia socialise? In some cases, they feel (or others feel on their behalf) that having dementia makes them inhibited. In fact, this makes me angry and upset. Why? I’ve seen the other side. I’ve seen the benefits, freedom and smiles. We always need others to help us. Take 72 year old Bill for instance, he spends his days in a strict routine, similar to that of his original occupation… a mechanic. Each morning he puts on his overalls, has breakfast then works in his garage to restore two cars inside. He returns at lunchtime to sit at the kitchen table, eats a ham and cheese sandwich with a glass of orange juice then goes back to the garage. He returns home to shower and finish for the day. This was his day, 7 days per week, 52 weeks per year with no change. Bill’s son, Joe asked for help from Daughterly Care and this is where the smile starts. We encouraged Bill to continue his love of auto-mechanics and ‘made it happen’ for Bill to get out, have fun and put joy in his life. Bill is taken to a Classic Car Show by our Caregiver. By doing so, it chipped away at his anxiety and depression. We started to create a new routine for him on Saturdays. 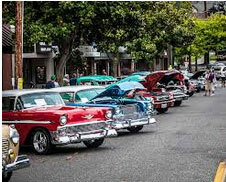 Now, he looks forward to Saturday… at times he tinkers in his garage with the cars but when he does attend car shows, it allows him to socialise with others who share his love of automobiles. “He opened the door… was dressed for the day (not in overalls)… looked me in the eye and said with the biggest smile, Where to today? Please say it is the car show!“. Interaction between those with dementia and their friends, family and carers is extremely important. Social participation and doing activities can liberate the mind. How does Daughterly Care do this? Who said socialisation and dementia ‘DOES’ mix? We do! Click here to view our services or ring us today to take the first step (02) 9970 7333. This is a very interesting read, beautifully written content message, if my father or grandfather was still with us today, I would organise this care for him. Congratulations on being a company that does look at the important bits of living. You sound like you do lovely things for people. Thank you Cindy for your response to our blog – we appreciate your words and taking the time to write to us. Remember we are here if you need us. Thank you Nathan for your response to our blog – we are glad you enjoyed this and appreciate you taking the time to write to us.